Wildlife is a measuring stick with which we can gauge the health and wellbeing of our human condition. Effective natural resources management includes paying attention to all facets of our natural environment. 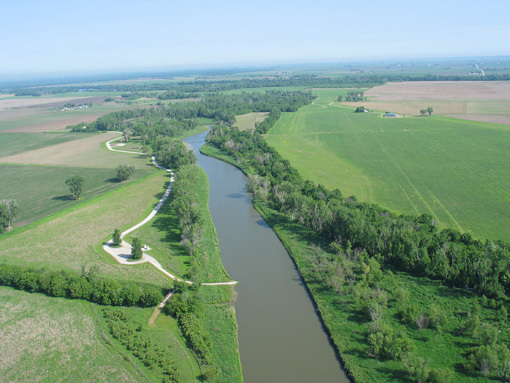 The Papio-Missouri River NRD takes pride in our desire to build projects that are truly multipurpose – achieving numerous goals, including wildlife habitat improvement or creation. Prime examples of this approach include the Back to the River effort to enhance Missouri River fish and wildlife habitat through the revitalization of lost wetlands. Another multipurpose project that greatly enhances wildlife habitat is Wehrspann Lake/Chalco Hills Recreation Area. This reservoir, built primarily for flood control, has hundreds of acres devoted to tree plantings, native grass, wildlife food plots. 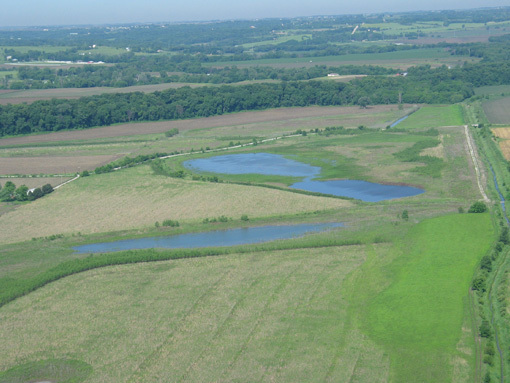 The District currently operates and maintains a wetland mitigation bank site, Rumsey Station, located along the West Papillion Creek north of 54th Street and Highway 370. By developing wetland and stream channel mitigation banks the District is able to restore, establish, enhance and preserve our natural resources while also providing compensatory mitigation for impacts to waters of the United States. Today, the Missouri River— the longest river in North America —is undergoing a transformation. Recreation, tourism and yes, wildlife, are returning along the Iowa and Nebraska borders in large part because of interrelated restoration programs – the Back to the River initiative in Sarpy, Douglas and Washington Counties is being supported by the Missouri River Corridor Project in Washington, Burt, Thurston and Dakota Counties. Both fish and wildlife enhancement efforts are in cooperation with the U.S. Army Corps of Engineers. Several Corridor Project sites have been identified and initial design work has been accomplished at several locations by the Corps of Engineers and the NRD. Already completed are improved wetlands at California Bend, north of Blair and Boyer Chute, east of Fort Calhoun. The Corridor Project also addresses cultural resources. Blackbird Scenic Overview in Burt County is designated as an official Lewis and Clark Trail site because it offers an unparalleled view of the Missouri River. The Overview includes a modern representation of an Omaha Indian earth lodge that honors Native American contributions to our history and expresses a continuing commitment to environmental stewardship. This Highway 75 roadside attraction was done through a partnership with the Omaha Tribe. Boyer Chute National Wildlife Refuge began as a 2,000-acre area, and has now grown to over 4,000 acres. Plans exist to expand the site to reach 10,000 acres in time. It was developed by the NRD and the Corps and donated to the U.S. Fish and Wildlife Service. The chute, east of Fort Calhoun, is a side channel of the Missouri River that runs for three miles across a bend in the river. Clogged and overgrown, the old Boyer Chute had become a victim of channelization, until the Army Corps of Engineers reopened it through an agreement with the NRD. Most of the land reclaimed by Boyer Chute Refuge was historically in the river’s floodway. Now restored, it is again a true refuge for ducks, geese and other migrating waterfowl, a breeding area for fish and animals including mink, river otter and many birds. For human visitors, fishing, hiking, bicycling and educational facilities have been developed. A hiking-biking trail has been completed from the Boyer Chute entrance south through Washington County to the Douglas County line. Recreational enthusiasts will be able to bike from Boyer Chute to Heartland of America Park by the end of 2010. Near Boyer Chute, Nathan’s Lake has been restored to bring back 250 more acres of wetlands and river-connected habitat. Joining in this effort are the Nebraska Environmental Trust, Corps of Engineers, and the NRD. A 400-acre river frontage that connects Boyer Chute to Nathan’s Lake has been purchased by the NRD. This area has been donated by the NRD to the US Fish and Wildlife Service. More future river habitat is being purchased as it becomes available by the Fish and Wildlife Service and the U.S. Natural Resources Conservation Service through the Wetland Reserve Program. California Bend is a yet another wetland enhancement project sponsored by the Corps and the NRD. Located near Blair, the California Bend improvements restored flows to the river’s historic channel and returned 215 acres of marginally productive cropland and degraded wasteland to highly productive habitat for fish and wildlife. A plan is being developed by the City of Blair for possible low-impact recreation opportunities at this site. Wetland wildlife habitat improvement is a concern of the NRD within the Omaha metro area as well. Rumsey Station Wetland, between 54th and 66th Streets on the south side of the West Branch Papillion Creek, is being preserved and improved for wildlife habitat and environmental education. The Lower Platte River is becoming clogged with invasive vegetation. Phragmites and Purple Loosestrife, noxious weeds that have invaded much of the Platte River across the state of Nebraska, are now robbing eastern Nebraska of critically needed water and wildlife habitat for the threatened and endangered Piping Plover and Least Tern. Human safety is also being jeopardized through the increased risk of ice-jam flooding along the river bordering Douglas, Sarpy, Saunders and Cass Counties. Because of the immediate threat of a Phragmites population explosion, The Papio-Missouri River, Lower Platte South and Lower Platte North NRDs are joining with river-side landowners and the Douglas, Cass, Sarpy and Saunders County Weed Control Authorities to begin an assault on the two invasive noxious plants. Crowding out native willows and cottonwoods, these plants reproduce rapidly, overtaking much of Lower Platte River, covering its sandbars and crowding its shoreline. Phragmites received a Nebraska emergency designation as a noxious weed in 2008. The overall goal of the project is to proactively control these noxious weeds in order to ensure public safety and the wise management of our natural resources now and for generations to come. Aerial spraying, the first line of defense against the infestation began in 2008. This control will be done on up to 1,000 acres of selected sandbars and portions of sandbars in the reach of the Lower Platte River extending from the Burlington Northern Railroad Bridge (downstream of Nebraska State Highway 77) to the mouth at the Missouri River. Very precise applications of an EPA approved aquatic herbicide will be made by helicopter utilizing GPS technology. Wildlife and today’s farming practices can co-exist in Harmony. The WHIP program offers cost sharing with landowners for the preservation or creation of wildlife habitat on private land. Sharing costs with the Nebraska Game and Parks Commission and landowners, hundreds of acres of wildlife habitat have been created and are being preserved. Your NRD offers cost share funding as well as technical assistance to landowners who plant trees for homestead windbreaks, field windbreaks, and wildlife habitat improvement on farms and acreages. A complete planting service is also available including planting your seedling trees. We cooperate with the Natural Resources Conservation Service for planting designs. Click Here for tree order form. 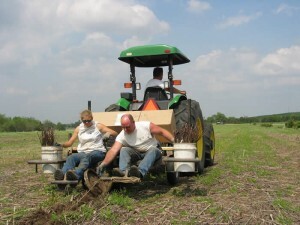 Find out more about Nebraska’s NRDs and tree planting at www.nrdtrees.org.